I was aware of role-playing games as a child -- I'd played the multiplayer version of Fighting Fantasy once or twice, I'd seen mentions of more complex games in magazines, and adverts for the 1983 Dungeons and Dragons red box were omnipresent in the Marvel UK comics I devoured each week -- but my proper introduction to the hobby came in the mid-90's when a friend -- noting my interest in the orcs-with-guns of Warhammer 40,000 -- suggested that I might like Shadowrun. For the next few years I played all sorts of games and was introduced to those that remain my favourites to this day, but for whatever reason we played D&D itself only once or twice. After a brief break during which I got a useless degree and moved to Minnesota, I returned to the land of my birth and -- remembering a thriving gaming culture in Brighton -- got in touch with the local gamers. There I met new friends and formed a new group, one that still meets to play once a week -- well, almost -- and that gave me my first proper experience of D&D. At the time The Game had just appeared in a brand spanking new fourth edition so we played that until we realised it was rubbish and moved on to other things; we settled on Pathfinder and aside from short breaks to play the odd bit of Call of Cthulhu or Cold City it's been the group's main game, so I've gone from almost never playing D&D to playing one version of it to the near exclusion of everything else. It's fine. I quite like the idea of D&D and we do have fun, which is the point after all, but Pathfinder is far from my favourite iteration of the venerable role-playing game. It's a bit too complicated for my liking, with rules for almost everything, and I prefer a looser, lighter system; something like Lamentations of the Flame Princess, for example. The problem is that for some members of the group games like LotFP are a bit too simple, too much of an overcompensation; what we need is something in the middle, not too complex but with enough moving parts to keep everyone interested. All of which brings me at long last to 13th Age. 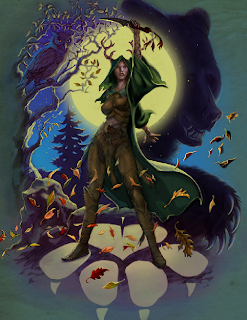 Bear in mind that I've not played it yet -- I've been waiting for my printed copy to arrive before I do that -- but I have spent the past couple of days reading the pdf and I like it a lot, which is odd as it has much in common with D&D4 and I hated that. D&D4 seemed to be all about combat so there were lots of rules and mechanics for hitting things, and while there was an attempt to deal with other aspects of play it all seemed a bit of an afterthought. There was also a sense that while packed with options, the combat rules were not designed as well as they seemed, as fights were interminable trials that went on almost as long as the three introductory paragraphs at the start of this review. 13th Age takes a similar approach but does it better; there's an admission that combat is an important part of the game so there are lots of tricks and tweaks, but there's also an acknowledgement that stabbing monsters should be fun so those tricks and tweaks are diverse and interesting and no two work in the same way. 13th Age also introduces the Escalation Die -- although I'm certain I saw an almost identical idea cropping up on one of the old-school gaming blogs a couple of years ago -- a simple way of emulating the increasing tension of battle, sort of like the Limit Breaks of the Final Fantasy games. A 13th Age fight starts just like any other fight in any other d20 game, but with the second round the six-sided Escalation Die comes into play. It starts at 1 and the player-characters -- and some opponents -- get to add 1 to their attack rolls; if the fight continues into another round then the Die is turned to 2, the bonuses increase to match and so it goes until the Die gets to 6. 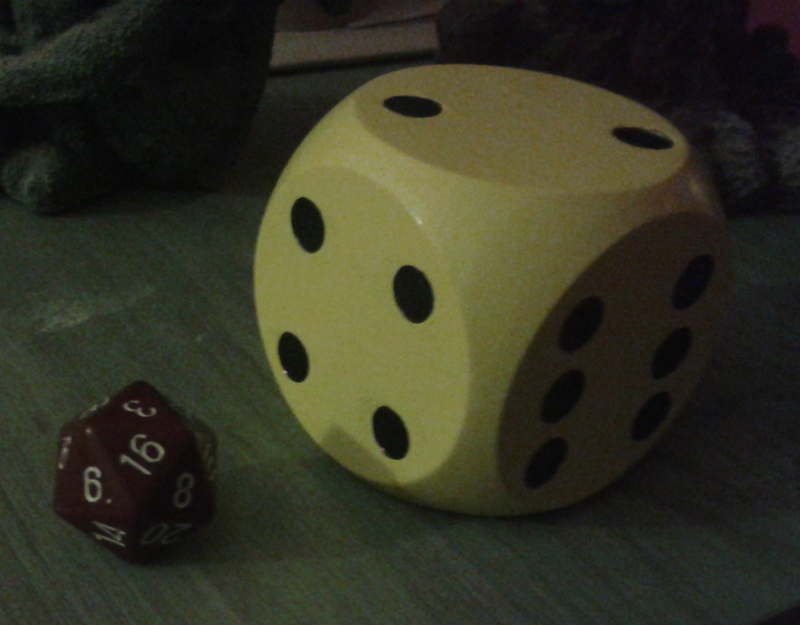 If the player-characters dawdle or are too cautious then there's a chance that the Die might reset to 0, and some abilities are triggered by the Die's current value, all of which results in a combat system that rewards action and avoids a sense of grinding. It's a fun and elegant mechanic with lots of potential -- I'd also use it to trigger reinforcements or for environmental effects like lightning strikes during a rain-soaked rooftop battle -- and I'm keen to try it out. 13th Age has good rules for sticking sharp things into the soft bits of one's enemies but the authors haven't forgotten that there is more to role-playing games -- even D&D derivatives -- than violence and have taken an interesting approach by more or less bolting an abstract story game on to the side. I must admit that it's not the smoothest join and it does feel a bit like two very different games rubbing together, but it's a better approach than trying to squash the non-combat aspects of the game into combat-based mechanics as D&D4 did. It does mean that players have to make a mental switch between Fighting Mode and Story Mode but that's not a bad thing; unified mechanics can be convenient, but they are not a good in themselves. I am most fond of the One Unique Thing and Backgrounds concepts. The former is something that's chosen in character generation and is an aspect of the character that sets them apart from every other character in the world; it's the kind of freeform idea I like and because it should have no mechanical benefit it should remain more or less immune to abuse. Backgrounds are 13th Age's replacement for skill lists and are also quite loose and liberal; a character might have "Soldier +3" as a background, so they could get a +3 bonus to anything a soldier might be good at, from devising battlefield tactics to polishing boots to a bright shine. Perhaps the player might be more specific and go for "Veteran of the Dwarf Wars +3" and so their character could also get a bonus when talking to other veterans of the conflict or remembering the name of a particular dwarven officer. I can imagine that some players might find the background system a bit too loose and woolly to be comfortable but I like the flexibility of it. I am not so sure about 13th Age's other big innovation, the Icons, but I think that's because I've not yet seen how they work in play. Instead of fitting into a traditional alignment system 13th Age characters are associated with one or more of the powerful non-player-characters of the setting. These NPCs are sketched out in vague terms so that they can be developed to fit individual campaigns -- home-made or published; the Lich King, for example, could be Bob the Necromancer or he could be Vecna -- but there's enough detail on their goals, status, and relationships with each other that a network is formed and then the player-characters fit into that network depending on how they spend points at character generation. One player-character might have a close, positive relationship to the Orc Lord, and would thus lean towards supporting barbarism and chaos but with none of the baggage associated with writing "Chaotic Neutral" at the top of their sheet. This part I like, if only because it should stop endless arguments about whether Lawful Good characters can butcher orc children; the bit I have some difficulty with is the mechanical aspect in which a character's relationship to an Icon is turned into a roll for various story effects. I'm quite happy with the idea of rolling Icon dice at the end of a session as a sort of impromptu scenario generator for next time, but I'm not sure about some of the other uses, such as rolling during the game to see if the random assassin who just stabbed you might have been sent by the Dwarf King; I'm all for emergent story in my games and I love a bit of swingy randomness but even so this approach seems a bit too arbitrary at first glance. All that said, I'm not sure I've understood the subtleties of the system and I suspect that it might work better in play. 13th Age does lots of other things that I like. Monster statistics are condensed to an almost Basic D&D bareness while still offering plenty of tactical options. The game's approach to magic items is wondrous -- pun intended -- with items having a sort of communal ego so that the more enchanted objects a character carries the more those objects will be able to exert control over the character's actions. The authors have also improved on D&D4's lacklustre ritual system by making combat magic the instant-gratification poor cousin of more powerful sorcery; acid arrow is a short, focussed burst of damage suitable for those occasions when an orc is trying to eat one's face, but given the luxury of time a ritual magician can get creative with the acid to burn through locks or poison a water supply or anything else they can imagine. Experience points have been dumped in favour of an encounter-based progression system in which characters can claim small improvements as they rise to the next level; it's similar in some ways to how Warhammer Fantasy Roleplay handles character growth, and as I love WFRP that's a thumbs-up. 13th Age is full of little treasures like this and so it ticks a lot of boxes for me. The book looks quite good, or at least the electronic version does. 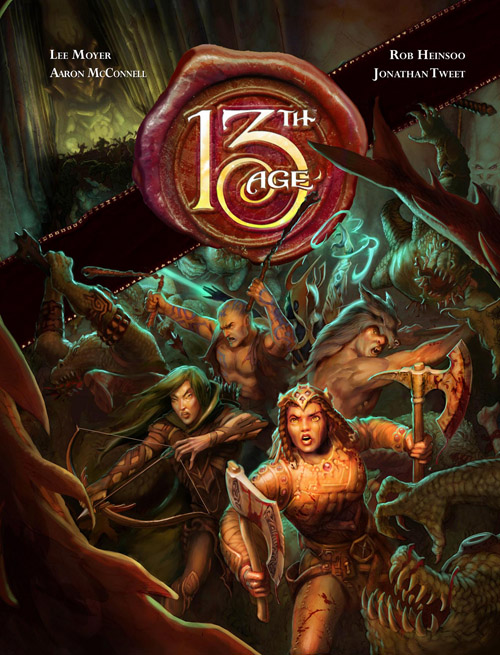 The layout is clear and the art is attractive, if a bit generic, but then 13th Age is competing with D&D and Pathfinder as a generic fantasy role-playing game so that's fitting in a way that an idiosyncratic Planescape-type approach to the visuals perhaps would not. The writing is at times unclear, as if the authors assume that the audience is familiar with some of the new concepts already -- it took me a while to figure out how feats worked, for example, and I'm still not sure I've got it right -- but it's also light-hearted and witty, with plenty of friendly sidebars explaining the thinking behind the rules. I'm a firm believer in moving away from the dry textbook approach and making game books interesting and fun to read -- everyone should read Small But Vicious Dog as soon as possible, even if they never play it -- so it's good to see that in something as high profile as 13th Age. I don't know if 13th Age is the version of D&D that everyone in my group will like, and I won't know until we've put it through its paces, but from what I've read it looks promising. It's not so complicated that it makes my brain hurt but it is full of options that should make games fun and unpredictable. I have high hopes. Great overview- I didn't preorder this and I've been considering it. I might see if I can buy a copy at GenCon this year. You're putting temptation in the path of certain people with that Veteran of the Dwarf Wars gimmick! Looking forwards to giving this one a go. I guess - when it comes out in its shiny book version, you can betcha that the rest of the crew will get a hardback copy and read it and want to play it. Looking forward to the hardback - better on my eyes!